The 18th edition of the Goodguys Southwest Nationals at Westworld in Scottsdale is officially in the books. We had a record turnout of entries, vendors and swap meet participants this year. My seat of the pants estimates for Saturday would be around 33-3400 cars, maybe a few more than last year. The layout this year allowed for more cars and space and so we did not have the Fire Marshal shutting down the entrance because the fire lanes were blocked like last year. The weather was absolutely beautiful for the entire weekend, clear blue skies and temps in the low 80s, frankly it was a Arizona Chamber of Commerce weekend. Unfortunately this year I was not able to make the Thursday Shop Tours, so please excuse the lack of coverage. Remember to mouse or swipe over the image to bring up the Slide Show Controls! Friday is typically my day for the Swap Meet and visiting the Vendors both of which seemed to be larger than I can ever remember in the past. The Car Corral was huge this year with some really decent buys to be had. Paul Nolte sold the ’34 Ford three window project car by 10 AM on Saturday which is good because he had bought back the ’29 Rat Rod that he had sold last March. The swap meet was also packed with sellers and buyers, I didn’t run across anything that I had to have so I went into the tent and bought a pair of stock height spindles from Fatman and a March Performance serpentine belt drive system for the LS3 in my 1940 project. Both had nice discounted show prices. I didn’t make my usual two passes around the field this year. I kept bumping into to people that I haven’t seen in awhile so I spent a lot of time chatting and getting caught up to date. This year I headed up to the gate for the goodbye waving car parade and was able to stand on the back seat of Larry Besore’s golf cart which made a great shooting platform with a different perspective than what I have had in the past. Another beautiful day in sunny Scottsdale! Michelle and I had planned to leave after the group photo of the club was taken at 1:00 PM so we would miss the award presentations, but I went around and photographed all of the winners. 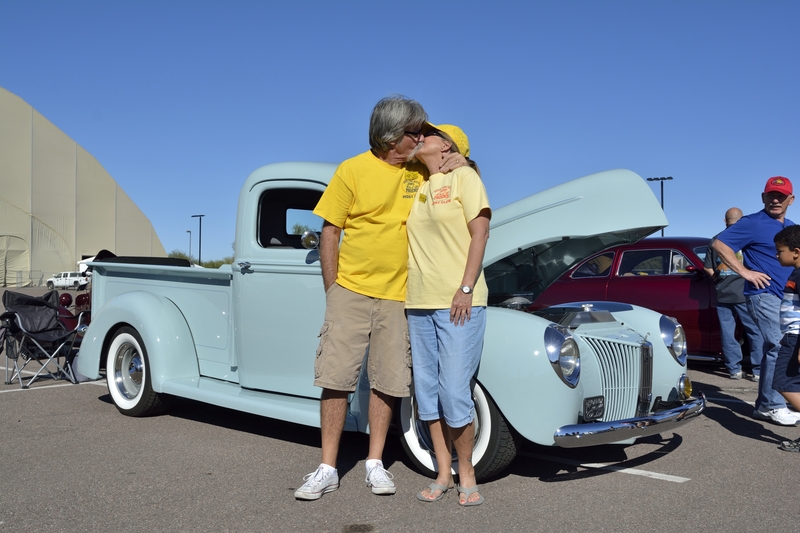 I was very happy to see that Rick and Debbie Aronson’s 1940 Ford Pick Up picked up the award for Best Truck! Well that about wraps it up for this time! Next up will be the annual Christmas Party on the 5th of December, followed by the club picnic and photo shoot on the 9th of January! I hope everyone has a wonderful holiday season and that y’all stay safe!